I usually devour Alison Weir’s non-fiction works. They are entertaining, informative and never boring. Until now. Well, I guess there must be a first time for everything. Although, in this case, the author is not entirely to blame. Writing a biography of the first Tudor Queen is no easy task for anyone. Elizabeth of York united, with her marriage to Henry Tudor, the houses of York and Lancaster, finally ending the wars of the roses and bringing peace to England. She also gave birth to Henry VIII, who became famous for his tyranny and his six wives. But not much more than that is known about Elizabeth. Alison Weir has definitely done her homework. The book is very well-researched and extensively noted, but the truth is there is not enough information on Elizabeth of York to fill a 600+ pages book. Therefore, Weir had to include every little mundane detail even remotely connected to Elizabeth and the people she knew. We are told what she bought and how much it cost. Her clothes and the palaces she inhabited are described in minute detail. A huge chunk of the book is also taken up by her husband, Henry VII. In fact, so much space is dedicated to him that you sometimes wonder whether this is a biography of Henry instead than of his wife. At the end of it, there are two appendixes. The first discusses all the images of Elizabeth that survive to our day, while the other is a list of all the women who served the Queen, with very scarce biographical information on each of them. All these details, rather than giving you a better understanding of Elizabeth, only bog down the book. And once you’ve reached the last page, you’ll be disappointed to discover that the real Elizabeth, the woman behind the crown, still remains elusive.We get glimpses of the scared and ambitious teenager who struggled for survival during the war, of the devoted wife and mother, and of her friendly relationship with her mother-in-law, the formidable Margaret Beaufort. But that’s all they are. Glimpses. I know my review has been quite negative so far, but the book isn’t bad. It’s just too long. But it is also very well-written and very informative. Weir did the best she could with the information she had, which wasn’t much. I wouldn’t recommend this biography to people who want a light historical read, but it’s a great resource for historians, writers of historical fictions or anyone else who wants to know more about the world she lived in or discover little-known facts that are never included in other books about this historical period. If you’ve enjoyed Caesar’s Ambassor, you’re gonna love its sequel, Caesar’s Emissary. After almost getting killed when acting as Caesars’ ambassador in Gaul, Marcus Mettius now accepts his request to go to Alexandria to check out the stability of Rome’s grain supply. Accompanying him on his journey are Apollonios, who has bought his freedom, and Nephthys, a gorgeous slave girl. Nephthys was about to be sold, so, before they leave, Marcus had to use his wits to save her from her new, depraved, owner. And so, they eventually arrive in Alexandria. The biggest city of its time, Alexandria had an exciting nightlife and a riot-prone population. It was ruled by the Ptolemaic dynasty whose members, when not marrying among themselves, kept killing one another off to gain the throne. One of the funniest scenes in the novella describes an ancient Rodney Dangerfield-like comedian making fun of the Ptolemies. It will crack you up laughing. Dealing with the Ptolomies, though, can also be dangerous, like Marcus will find out for himself. Marcus is as fun as ever. Clever and witty, like the good salesman that he is, he knows how to work a crowd and solve any problem life throws at him. Like I’ve said in my review of Caesar’s Ambassador, it’s not easy to create well-developed and likeable characters when writing a short story, but Johnston has achieved just that. If anything, he’s got better at it. The story is told using modern slang, but when talking, the characters often use words and expressions the people of their times would have used. The result is an interesting mix of anachronistic and ancient languages that works really well. Very entertaining is also the humorous tone that pervades the entire story. I also appreciate that, at the end of the book, Johnston tells us from what historical facts the story is inspired from and what events he has instead made up. That way, if you’re not familiar with ancient history, you’ll learn something new. And in a very entertaining way too. I highly recommend Caesar’s Emissary to anyone who enjoys a good and funny story. Are you a fan of Beethoven? Do you want to learn more about the man without reading a boring biography bogged down by musical theory and scores you can’t understand? Then, I highly recommend you pick up this book. 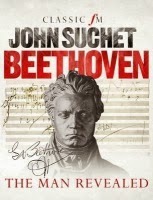 It’s written by John Suchet, an authority on Beethoven. He’s written six books about the famous composer, so he definitely knows what he’s talking about. In Beethoven: The Man Revealed, Suchet paints a vivid portray of Beethoven’s life. Key to understanding it his deafness, which started to afflict him in his mid ’20s. One of the greatest musical geniuses of all time, Beethoven, despite his illness which he never allowed to get in the way of his work, gave us some of the most beautiful and dramatic music ever written. Yet, he was notoriously slovenly, liked in squalor and, especially in later life, was often mistaken for a tramp or madman by people who didn’t know him. Beethoven, though, never was the easiest person to get along with. He was socially awkward (something his deafness enhanced) and had a rigid moral code that often led him to argue with his family and his closest friends. He also fell in love very easily, but he never married. Instead, after his brother’s death, he started, and won, a bitter and cruel battle for the custody of his nephew Karl, with disastrous consequences for everyone involved. Of course, Suchet also discusses Beethoven’s work, but he’s more interested in what inspired them and the anecdotes connected with them, than with musical theories and terms. This makes the book accessible to anyone. It will also make it easier for the reader to connect to Beethoven’s music. And for an even better experience, make sure you play the pieces while they are being described in the book. You’ll appreciate them even more. The book is also very well-researched. Suchet draws his information from a wide variety of sources, including the conversation books Beethoven used to communicate with others. But he also makes up some scenes (always clearly stating it when he does so). For example, while he’s talking about a particular event or a discussion the composer had, Suchet imagines how it all went and what words they spoke. Rather than cheapening the book, though, this device enhances it, making the reader feel like he/she was really there. Overall, this is a charming, informative and entertaining book that every Beethoven fans, regardless of how extensive their musical knowledge is, will greatly enjoy. Have you read these books? If not, are you planning to pick up one (or two, or three)?